New to surf fishing, and taking a vacation to FL Space Coast area in Feb., I went on-line and researched over several days on recommended equipment. The art and science of the sport just got bigger and bigger, and what to get seemed more difficult instead of less, then I happened upon a forum where Tommy Farmer helped someone such as myself. I called Carolina Cast Pro and spoke with Tommy, verifying some things discussed about the AKIOS S-LINE 656 CTM reel. Jeez, what good luck, and a relief for me to find quality at a price point that I can afford. He took the time to talk with with me giving me advice that is essential. I bought my first Cast Pro (6 to 10) from Tommy while he was on Hatteras Island in October. I also got a chance to spend an hour with him for a lesson. Even though I've been surf fishing for 20+ years I learned a lot, he is a great teacher! I now have a renewed excitement for surf fishing and I've never been able to cast this far with consistency. As Tommy put it "I'm fishing new waters". This week I gave myself a Christmas present of 2 new rods, a Cast Pro 8 to 12 and a 3 to 6, I was really impressed by the packing and shipping, they arrived in pristine condition, shipping the rods in a sewer pipe is a nice touch. I'm headed back down to OBX for the week after Christmas to try out my new toys. Thanks Tommy. Cast Pro Series 8’ ½ to 1 ½ oz rod review. 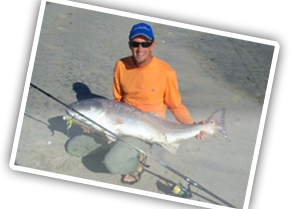 A few weeks ago, I went to Charleston SC on a fishing charter targeting sea trout and redfish. On this particular trip, i used a Legend "heavy hitter" popping cork with about 5ft of 20lb mono attached as the leader. I normally fish with heavier rods so this is the smallest rod of my arsenal. The tide was rolling in so I began to catch a few smaller trout, but not the size that I wanted to fight. After an hour or so of incoming tide, the bigger trout came through and it was time to have some fun. Not only is this rod very light, it's sensitive and has a lot of backbone. I caught over 20 trout that ranged between 3-4 pounds and the rod begged for more punishment. The biggest catch of the day was a 6lb redfish that tried to go under the boat and do crazy runs in the current, but the rod was able to control the fish so i could get it on the boat. A couple of days later, a friend and I went surf fishing in Pawleys Island SC at the north inlet. A beautiful place to fish, but rocks and wood are near the shore so being attentive is a necessity to fish here. I tied a direct connect of 20lb shock leader to the 15lb braid. I created a single loop drop with a 1.5oz weight on the bottom. I hooked into a few decent size bluefish that gave a great fight. Once again, the rod handled the bluefish like a pro. I casted out a chunk of mullet and within a couple of minutes, the rod tip shook and then tipped over. I thought that the current pushed the weight into the rocks, but as i began to reel, there was something on the line and it was pulling drag. I set the hook and I could feel every bump and turn that the fish made. After fighting the fish for a few minutes, my buddy told me that it was a stingray. I had to muscle the stingray with the rod to get it closer so i could dehook it. The stingray was estimated to be around 20-25lbs and the rod had no problem fighting the fish. Pros: very light weight,reasonably priced,2 piece design is great when space is a concern and lots of power and backbone to cast and pull a heavy fish. The only rod that I don't own in the cast pro series is the cps 11ft rod and I will be purchasing it within a couple of weeks. If you are serious about fishing and want a quality product that can achieve multiple saltwater demands, give these rods a try. I guarantee you will be pleased. I personally would like to thank you for your superior customer service and advice. When I placed my call to you regarding availability on the 11' 2-5 I was not expecting a call back within the hour, as well as your advice and concern. As well as having my order shipped ASAP and arriving at my door at a incredible time and securely packed might I add. Will gladly be doing more business with you in the future. Thank you again Tommy.